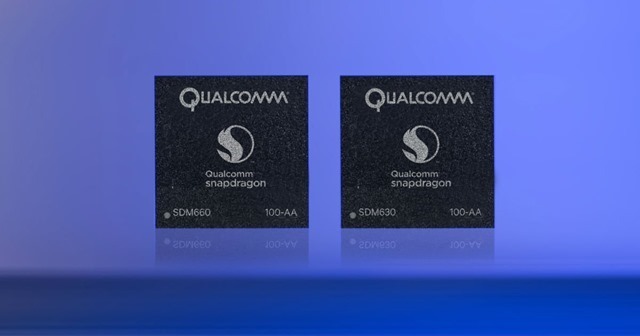 The Qualcomm Snapdragon 660 and 630 chipsets have officially been announced by the OEM, and are the successors to the Snapdragon 653 and Snapdragon 626 respectively. The mobile chipset manufacturer says that these two SoCs built with 14nm process, will perform similarly to flag-ship like higher-tier processors. New additions to the chipsets include the Qualcomm Spectra camera ISP, Qualcomm Kryo CPU, and Hexagon Vector eXtensions (HVX). The first one, Qualcomm Spectra camera ISP is of course related to dual cameras, which will now be available in budget friendly devices. The Snapdragon 630 supports up to 13MP + 13MP for dual cameras, while the 660 is capable of powering dual 16 megapixel lenses. The SD 660 chipset comes with the Qualcomm Hexagon 680 DSP, with HVX, meaning that it can support better camera performance than the ISP can. Speaking of which both chipsets feature a 14-bit Qualcomm Spectra 160 Image Sensor Processor (ISP), and support cameras which can shoot (up to) 24 megapixels images with zero shutter lag, and is capable of smooth zoom, lightning-fast autofocus, true-to-life colors. The cameras are capable of 4K video recording and playback and can capture videos at 30 frames per second (30fps). Qualcomm is upping the ante for the Snapdragon 660, by bringing its flagship custom Kryo core technology to the mid-range chipset line. The Snapdragon 660 is an octa-core processor which supports Kryo 260 cores is 20% better than the SD 653’s performance. The Snapdragon 630 on the other hand will use the power efficient ARM Cortex A53 cores, a 10% performance upgrade over the SD 626. The chipsets supports up to 8GB of LPDDR4 Dual Channel RAM with Snapdragon 630 supporting a maximum frequency of 1333MHz, while the SD 660 can support 1866MHz. The new graphics handlers are Adreno 508 and 512 GPUs which are 30% better in terms of performance than the 506 and the 510 GPUs. The new chipsets will support Qualcomm Quick Charge 4 for fast charging, which according to the company can charge devices up to 20% faster and is 30% more efficient than the previous gen. The QC 4 tech can provide 5 hours of talk time with a five minute charge and can power a phone’s battery by 50% with 15 minutes of charging. Connectivity wise the SoCs will support Bluetooth 5, and also new to the 600-tier, is the X12 LTE modem is a significant upgrade from the X9 LTE modems, which the previous versions came with. The X12 supports download speeds of up to 600 Mbps, double of X9's 300MBps downloads, and the 2x2 MU-MIMO 802.11ac Wi-Fi will give stronger signals even through brick walls.Qualcomm says that the Snapdragon 660 and 630 chipsets will support all biometric authentication technologies including fingerprint scanning, iris scanning, facial recognition, and voice prints. Devices powered by the Snapdragon 660 could arrive soon as the chipset is available to OEMs now, while those which come with the Snapdragon 630 may arrive later.